Traveling with twins should be a section taught in a logistics MBA class and a side note in your fitness trainers book ‘training for a marathon’. As a parent of twins you will need to use all the concepts of constraints, first in first out, efficiencies and bottlenecks. I have to say my MBA logistics class at Ivey did prepare me somewhat but it did not prepare me for the sheer exhaustion you feel when it’s over (not even a 48 hour case report can come close). I think back to the first two years of travelling with the twins and I have to say it can be compared to running a marathon (I’ve witnessed runner’s appearance and energy level first hand when they cross the finish line). I have traveled with my twins since they were 2 weeks old. I’ve taken the girls on airplanes as of 6 months old and they do have frequent flyer numbers since they have traveled on 16 airplane trips in their short 3.5 yr. life. Our guest writer Rashida Ronaque traveled with her 9 month old twins and husband to Yemen, Egypt and India. Click here to just view Rashida’s report. For any trip whether it’s a weekend away or a one week vacation by car or air you need to make a list of items that you need on a regular basis AND when your kids are sick (you don’t want to be running to find a drug store when you arrive with a sick kid, plus some countries don’t have the same brands that you know work for your kids). Be sure to make a list for you as well. Determine if the place you’re visiting has laundry facilities – if not, you know your kids and determine how fast they go through clothes, burp cloths etc. and make the adjustments accordingly and then ADD 2 more of everything. Then bring a zip lock bag of detergent for those items you need to wash in the sink. If you’re traveling to a destination i.e. vacation spots (Hawaii, Disney, Whistler, New York etc.) determine if they have child equipment rentals i.e. pack n plays, strollers, car seats. In addition some of these spots have excellent sitter services so be sure to get a referral when booking your accommodations, in order for you to get a break. Some rental car agencies do rent car seats – Entreprise for example, call ahead and reserve. At 6 months because I hopped to three different places and didn’t want to haul a pack n play I used the Kidco Peapod because it folds up to the size of a dinner plate. 4. If you’re going for a long trip and you’re within the USA use Amazon.com or other delivery sites to have your diapers, formula, wipes etc. delivered to your destination. In Canada there is well.ca. If you’re traveling elsewhere find out from friends which service can deliver similar to one you currently use. 5. If you’re traveling to family – ask family/friends for equipment otherwise you can always try Craig’s list and have it dropped off to your family’s residence. 6. Traveling by air – the different airlines have different rules. But the one that most of them have in common is that twins under 2 (or children under 2 of the same family) cannot fly with one adult and you can’t sit in the same row because of the oxygen masks. So before you fly you need to check with the airline whether or not you can be in the same row. Determine their policy on double strollers, carry-ons, baggage for babies, toddlers, fees for extra bags and how and when you pay for it. 1. Checked luggage: I have two large red Sienna 26 Inch Deluxe Sports Rolling Duffel bags that have wheels and a handle that pops up. I chose red because I can spot it easily. I use two if I go away for 1-3 weeks, I only use one which includes husband, kids and my stuff if I go away for a long weekend. I also check my car seats. If you’re flying international or on an airline that sometimes loses bags – be sure to pack for all of you in both bags so that if one is lost for 24 hours you’d be able to make do with one. 2. Carry Ons: Before the age of 2, I traveled with my diaper bag and 1 back pack (my husband carried the backpack because we each held a baby). In my diaper bag I had the regular stuff – diapers, wipes etc. What I did though is I thought through the travel day as a regular day – counted up how many diapers I needed and then ADDED 4 more just in case. I also had an extra shirt for my husband and me because one of our girls had a gag reflex and would get me all the time. So I figured an extra shirt would be handy. I packed two empty clean bottles, formula, 2 pacifiers, (the other 2 pacifiers were in my fleece jacket that I wore) had infant Ibuprofen, Benadryl, AND Lysol disinfectant spray and Clorox wipes in a plastic bag. See ‘boarding’ below to read why I carried those. For my 6 month olds I had baby mum mums, plum fiddle sticks, Peter Rabbit squishy’s (that I had given them BEFORE the flight to ensure no allergies). In the back pack – my husband’s laptop, iPad, 2 more bottles, 2 small blankets, 2 luvies, toys that I had purchased and cleaned and wrapped from the $1 store, and new flat books. I also think about the trip and what I’ll need first i.e. tickets or passports, wallet to buy things so I have those items at the top of my bag for efficiencies. When the girls were 1.5 yrs I had them start carrying their tiny backpacks with the two new books and toys. They weren’t allowed to open them until they were on the plane. Now at 3.5yrs they are able to carry their bigger preschool backpacks with books, toys and headphones. 8. 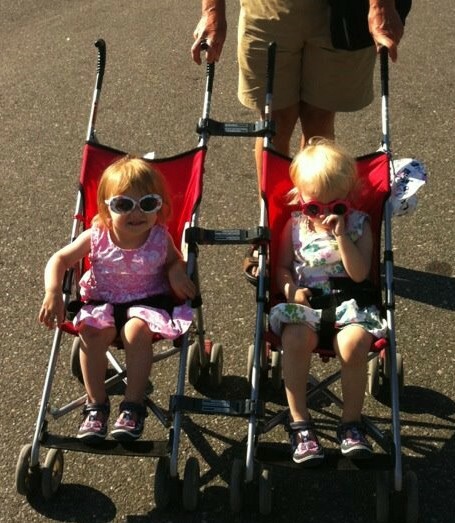 Carriers/Strollers – when the girls were 6 months we just used Snuggli carriers – and did not bring a stroller. See photo at top of blog. I strongly recommend you bring a stroller to the gate (pending on airline) and then put your carrier on at the gate. The reason is that if you both have babies on you and no place to put them down in the airport it’s difficult to grab a coffee or go to the restroom! The strollers that we use and continue to use are the cheap umbrella strollers and latch them together with the munchkin adapters – see photo. That way if they’re lost or broken I can buy new ones. As the kids aged they played with the strollers in races up and down the airport = wearing them out. Always bring a stroller especially if you change flights because toddlers walking from one end of an airport to the next is not happening AND at the end of a long flight they may be sleepy and not in great moods. The stroller also acts as a carrier for my purse, food purchases and their backpacks. See how I travel now with one stroller and put one on top of the other. *Note most airlines won’t let you have your babies in the carrier when you take off. HOWEVER wear your carrier, hold your baby snuggly while take off and then fasten the carrier. You may have children like us who fall asleep on takeoff and then your arms cramp because you didn’t have your carrier on properly. You do not want to wake them up if it’s their nap time plus you’ll be able to get through an hour or two without entertaining them or dealing with the screams. We also used our small blankets as a black out curtains so they could fall asleep if it was not a night flight. 9. If you feed by formula – do not buy water prior to security, wait until you are through and buy a large bottle. Never use the water that is given to you on the plane. Scoop out your formula (that you might need on your trip) and double it (you never know if the plane will be delayed). Place it in zip lock bags = not as cumbersome as a formula container. Bring 4 sets of bottles. If you feed by breast – and you’re bringing some in bottles remember security will check the milk in the bottles, so have it readily available within your bag. 10. Try to book flights that correspond to the nap schedules and time changes. I.e. we fly to Toronto which has a 3 hour time difference. We take the 8 am direct flight which means we get the girls up at 5:00 am PST which is 8:00 am EST. We do have the car packed and ready to go so we just have to wake the girls, dress and they can eat breakfast in the car. When they were 6mths– we’d wake them earlier – 4:30am and feed first and then put them in the car. They would fall back to sleep (sometimes) and then wake just about the time we’d go through security. The twins exactly the same. When they’re babies – people will assist you even the security, flight, immigration staff and complete strangers. When they’re toddlers – same reason but with one added bonus – you can recognize them quickly if they start running, as well as if one did get lost you can say quickly to security – they look like that one. 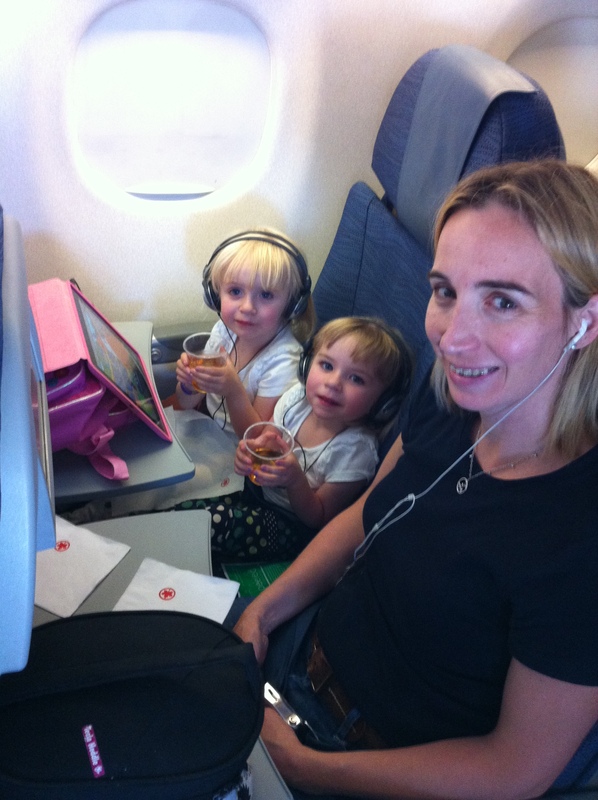 Mom/parent traveling – jeans, t-shirt, fleece with pockets, running shoes and put extra deodorant on. You will be sweating right from the start. (I recommend jeans because they hide stains well, t-shirt because you’ll be sweating even if it’s cold – you’ll be passing babies back and forth, a fleece – soft to be an extra blanket for kids and the pockets hold the 2 extra pacifiers (because you know they will be thrown, dropped etc.) running shoes because you can run after them. 12. Checking in: Streamline your logistics. If you can check in online – do so. Determine how long you will wait in line at check in if you’re checking in bags. For example – we travel Air Canada to Toronto, they usually have 4 people working, there is no online check in from Seattle to Toronto, there is a HUGE line. So we go early – the recommended 2 hours and it usually takes 45 minutes to dump our bags. Air Canada does not help you bag your car seats and they do NOT provide twist ties for the bagging of your car seat. So take those industrial twist ties because twisting that plastic bag around and trying to knot without a twist tie gives my husband something to swear about. 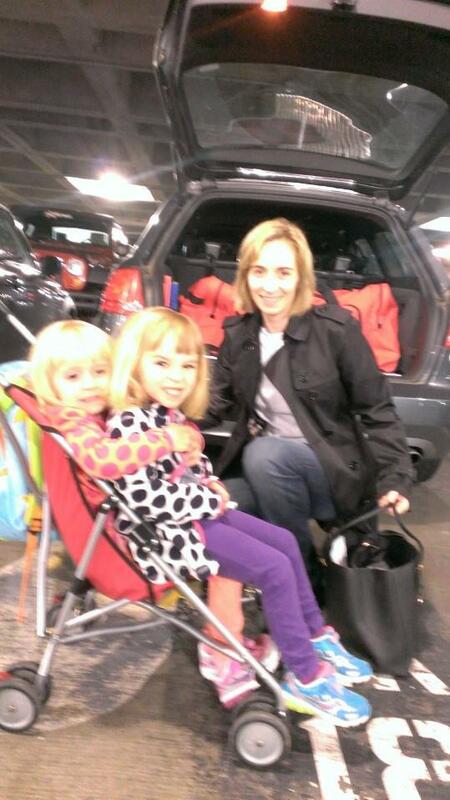 Checking car seats – We check our car seats at the ticket window. There is controversy over this – if you check it the baggage handlers have a tendency to throw the seats around thus making them less effective in a car accident, however if you rent seats at the car rental place you have the extra time and lack of energy trying to figure out how they attach to the car etc. (because the car rental place cannot put them in for you) Remember at the end of the trip YOU will be exhausted and you will probably have screamers. If the check in line is long and you have babies in car seats – pull out a new toy, for toddlers/preschoolers bring a new flat book when they get fidgety. We usually have a stroller race or go explore. When I travel on my own with the girls, I have my husband help with the check in and baggage drop. He departs at security. Having someone help with the luggage is a must. 13. Security – SeaTac does have a family line and there are security guys who have twins and do let you go to the front of the line. Remember they will ask (if you don’t have TSA approved status) to remove shoes, belts etc. so don’t wear belts and wear shoes that can be easily slipped on and off i.e. running shoes. 14. Immigration – depending on where you’re entering and exiting the US be sure you have your passport, Nexus passes etc. If you are traveling without the father – be sure to have a letter signed by the father that he knows you’re leaving with the kids out of country. They can ask and can stop you. 15. Waiting to board – at 6 months we just walked around airports with the girls in their carriers, grabbing coffees and visiting the restrooms. When they started walking we just had them walk/run. At SeaTac there is a play room where the kids can release some energy. But most airports don’t have that. The first thing we do is grab some food for the airplane and then the races start. They race to cement pillars, garbage cans, chairs etc. We ride the walking escalator. We go and explore. I just try to get them tired out! 20 minutes before boarding we go potty. 16. 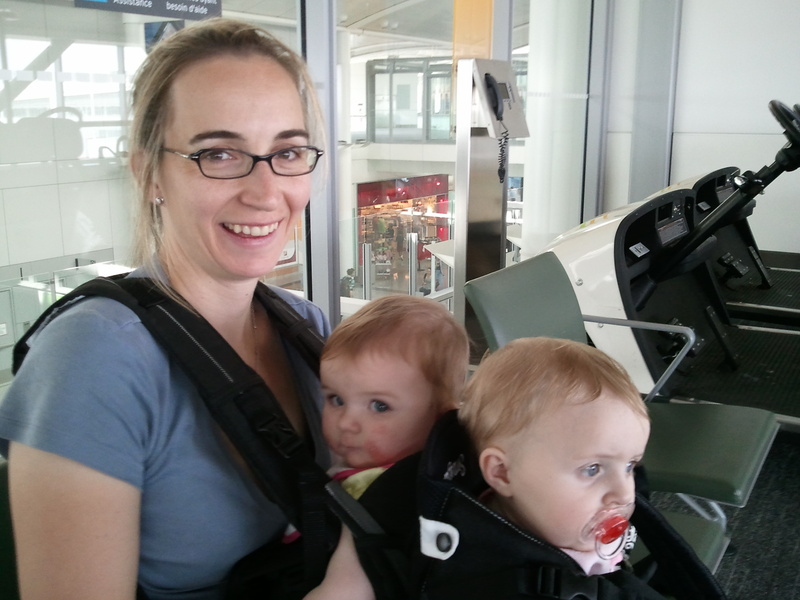 Boarding – with 6 month babies – stroller up to the gate, be sure to board when they call families with small children. Put babies in carriers and grab your Clorox wipes and Lysol disinfectant spray. Before you sit down on the seats – spray the area with disinfectant spray. Then wipe down the tray tables, arms of the chairs, the window area. Your babies will be touching everything and then everything goes into their mouths. The dirtiest place on an airplane are the tray tables. You know you don’t want your kids sick especially on a vacation. 17. Taking off and Landing – at 6 months we just bounced them around on our laps, pointed to various items to occupy them right before takeoff. Our girls had pacifiers so they sucked on their pacifiers on the way up. As soon as the plane took off they fell asleep. Unfortunately I wasn’t wearing the carrier and was holding a sleeping baby for 1 hour. I tried to keep the idea of a typical day going even though we were in a plane. So when the girls woke I fed them (didn’t change their diaper if it wasn’t wet), played with them, walked up and down the aisle, and of course brought new age appropriate toys. Just before landing I started to feed them to help with the ears popping, then gave them their pacifier. At 1.5 years this is what I started to do and continue to do so because the flights still won’t allow iPads to be open or devices to be on. So while we wait for the flight to taxi out of the gate or taxi in I open their backpacks and bring out new books, new dollar toys etc. to keep them occupied. I also have lollipops for the takeoff and landing – especially for the landing to help with the ears. 18. Care Harnesses or Car Seats on the plane – this is a personal decision. We checked our infant car seats and used carriers because we felt safer, there was less stuff to deal with on the plane, and under the age of 2 they can sit on your lap (thus no added expense) whereas you’d have to buy another seat for the infant car seat. When they were 1.5yrs, again we opted to check the larger toddler car seats instead of bringing them on the plane. We did buy an extra seat for wiggle room, we held on to the girls during take-off and landing. During the flight they fit side by side. See photo above. There is the travel Roll ‘n Go Car Seat Transporter for your toddler car seat that you can use. However we again chose no car seats and used the stroller. One thing to watch for is – if you are traveling alone and you have your car seats with you, the aisles of the airplanes are usually too narrow to fit the car seat through. So you’ll have to get your kids out of the car seats, carry the car seats to your airplane seats and then go back again for the other one. Just make sure your kids are okay with sitting by themselves while you trek back and forth through the people. The Child Airplane Travel Harness – Cares Safety Restraint System – The Only FAA Approved Child Flying Safety Device is another option to determine if you want to use. A friend has used them on all their flights (over 30 flights) but we didn’t. My husband’s philosophy “If we’re going down, it’s not going to help!” If there is turbulence usually the kids are right beside me and I hold on (I usually sit between the girls and put my arms out like barriers). Again – personal choice. 19. Disembarking – I don’t enjoy sitting around until everyone is off the plane and we’re efficient enough that we just grab our stuff and go – just as fast as everyone else. When I started traveling by myself with the girls and the 2 big red bags, 2 car seats and stroller I knew I couldn’t manage grabbing my bags at the baggage terminal without help. So I hired the porter by the baggage claim for $20. That is the one thing I couldn’t do without. Now the girls at 3.5 yrs. are able to hold onto the baggage cart or stay put when asked. 20. Renting cars/minivans – be sure to find out when renting your car at the airport where exactly is the service. In Hawaii we had to take a bus to the rental car place. That meant piling all the ‘stuff’ onto the bus, then emptying it all, waiting in a long line and then piling it back in. Again – bottlenecks – be sure you have a solution for them! Also some car rental agencies price their rates higher at airports and less at other locations. If you can have people pick you up and then rent a car away from the airport that might be better. 21. The Toilet! If your babies are in diapers still, change them on your lap. It’s cleaner than the restroom. Unless they pooped! The restroom is a comical act that I have now perfected when the girls were potty trained at 2 years of age. My girls always want to be with me and don’t want to stay in their seats if one has to go, so we all three go to the restroom. You know if you leave one outside the door they will pull a handle to something that might cause difficulties so it’s best just to have everyone together in that small space. Step 1 – take Clorox wipes and wipe down the seat and all areas in touching area. Step 2 – have one child stand with their back to the toilet paper roll. Step 3 – take your Kalencom On the Go Potty, lay it flat on the seat. Step 4 – take second child and place on the potty. Be sure to remind them only to hold onto the purple handles. The parent is able to fit with their back to the door. This potty is the best potty ever as it fits into a purse. One of my daughters had to go potty on the descent into the airport. I was able to take it out of my purse with the bag, slide it under her with her seatbelt on, wrap it up and put it under the seat while we landed. This has happened twice and yes I’ve taken her to the restroom prior to this experience. 22. Safety – With toddlers running/walking in different directions in a large crowded space I invested in bracelets so if they did get lost they would be able to show someone their bracelet and have me called. The bracelets I use are Road ID. The Safety Education and Skill Set I use is Savvy Parents Safe Kids. One other thing – Have people come to you when you have traveled with your babies. You’re the one with the kids. It’s difficult to transport all the ‘stuff’ to other places. Keep one place as your home base and take day trips. Just remember things will not be perfect. Things will go wrong…its how you handle them. Remember any issues and make the changes on your next travel. Time for a vacation…. Yay! Travel to exotic locations…. Hooray!! Wait a minute…. We have multiples! … And they were just about 9 months old. The daunting task of traveling with twins. Once we decided where we were going (Yemen, Egypt and India) and the amount of time (2 months), it came down to lists, lists and lists. I wrote down everything they would need on a daily basis – diapers, wipes, bottles, formula, solids (pouches), a few toys, hand wipes, enough clothes so on…. It was all mostly baby lists. But it helped to get organized and get your mind in the travel frame. Everything will go fine if you’re not married to your schedule! Go with the flow… Things will go wrong. Move on. I packed in such a way that all the bags (6 in total) had everything equally for all of us. Hubby’s things, my things, kid things. That way if a bag got lost we had others with our stuff. I put everything in zip lock bags and labeled them in my diaper bag, so that security checks were easy breezy and no one gets to touch my baby things. The labeling also helped hubby find things too. The flight from Seattle to New York was a little challenging, as we had the kids on our laps and we were in different rows… Airline rules! I had some treats for the passengers 2 rows before and after us, to soften the blow of the crying babies… Just in case! For ear pressure I had Sippy cups for the girls with water and that helped a lot during takeoff and landing. I kept them on Seattle time until we got to Egypt. The baby carriers help with holding your baby and walking up and down the aisle hands free. We also bought the Similac 4oz packets for diaper bags during flight travel… Easier to carry and no measuring needed. Egypt was fun, we were there for visits to holy shrines as well as got to do some sightseeing. Boat rides, pyramids and the crystal museum too. We fed the girls on the go and they slept through long car rides. We didn’t carry any car seats as most these countries don’t have strict laws on that yet! So they were in our laps and enjoyed watching out the window. We did get two umbrella strollers with the munchkin attachment so it becomes one stroller to handle at airports. Yemen is a beautiful country and though still developing, we had packed enough of their food and formula and diapers to get us through until we landed in India. The climate in both these places was pleasant… Though I had packed a lot of winter things for them! Never used them!Needless to say they were celebrities everywhere we went. Twins! There is something so fascinating about having two at the same time. People will bend over heels to help you, if you just ask. India was a whole different ball game. The weather was HOT and HUMID! Girls fell sick – diarrhea, fever, and mosquito bites! We did carry a mosquito net with us… Which we started using after the damage was done! I could blame that on my mama brains and being tired after two countries!We still stuck to our bed time routine of bath, food, book and lights out by 7… It was the naps that I allowed wiggle room. Which worked fine for us, as all the travel and driving around would get them tired to make sure bed time was easy. I also carried the red light with us so help us navigate the room once the girls slept as well as the noise machine. For the most part the girls were healthy and had a blast in all the countries! It felt like we deserved a medal to have managed everything and still be sane! Now the only mistake that we made was booking a flight from Dubai to Seattle (Emirates). 15 hours flight! Jeez! What were we thinking….? Or not thinking in this case. I put the girls the bed the usual time and had to wake them up at midnight to get to the airport. They were doing so well through check-in, boarding; which made us confident that the flight would be ok! So… Once flight takes off… Hell begins! It was 6 hours of crankiness, crying, not able to fall asleep and both wanting only mama for comfort. In an economy class… This task is impossible to achieve! So we had the girls in our carriers, and were walking and swaying for most of that flight and they finally fell asleep! The hostess was kind enough to take a picture of all of us finally asleep!! Now that’s a memory I’ll never forget!